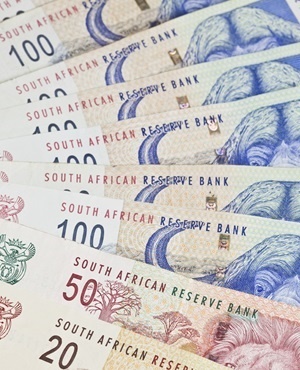 Johannesburg - The rand showed some signs of recovery on Friday after touching a record low in the previous session, but markets remain on edge after the shock sacking of Finance Minister Nhlanhla Nene this week. Stocks opened slightly higher after also suffering in the last two days in the wake of Nene's removal. President Jacob Zuma's removal of the respected Nene in favour of a relative unknown, lawmaker David van Rooyen, sent shockwaves through South Africa's financial markets. By 09:00 the rand had inched up 0.42% to R15.41/$, paring some losses after plunging more than 5% following Nene's removal late on Wednesday and falling another 1% on Thursday. Technical indicators offer a chink of light for any remaining rand bulls with 15.50 seen as an important support level. The local unit is trading at 80 on the 14-day relative strength index, well into oversold territory. "Markets usually settle quite quickly but it is so hard to price the news that we expect ongoing swings today, although probably of a smaller magnitude than yesterday," Rand Merchant Bank currency strategist John Cairns said. Yields on government bonds remained firm on selling pressure, with the benchmark paper due in 2026 steady at 9.910%, its highest level in seven years. The JSE's Top 40 index opened 0.4% higher at 44 425 after losing 0.7% in the previous session. The broader All-share index rose 0.3% to 49 124 points, having dropped more than 1% on Thursday. Index heavyweight Naspers [JSE:NPN], consumer goods firms Richemont [JSE:CFR] and British American Tobacco [JSE:BTI] were among the early gainers. Markets will be looking for more detail later in the session on Van Rooyen's plans when Minister in the Presidency Jeff Radebe briefs the media on the outcome of Wednesday's cabinet meeting.